New Voices, a theater department program begun in 2005, showcases original works by student playwrights. With a faculty member serving as director and a staging at the University’s Robsham Theater Arts Center, the undertaking affords student writers “the experience of going through the full production process,” says theater department chair Scott T. Cummings, who is directing this year’s two one-act plays (he also led New Voices productions in 2005 and 2007). Premiering on February 23 in the Bonn Studio Theater will be The Missing Piece by Riley Madincea ’11, a tale of estranged siblings reunited by a death in the family, and Chase 304 by Meghan Crosby ’12, a look at the romantic preoccupations of eight undergraduate women. 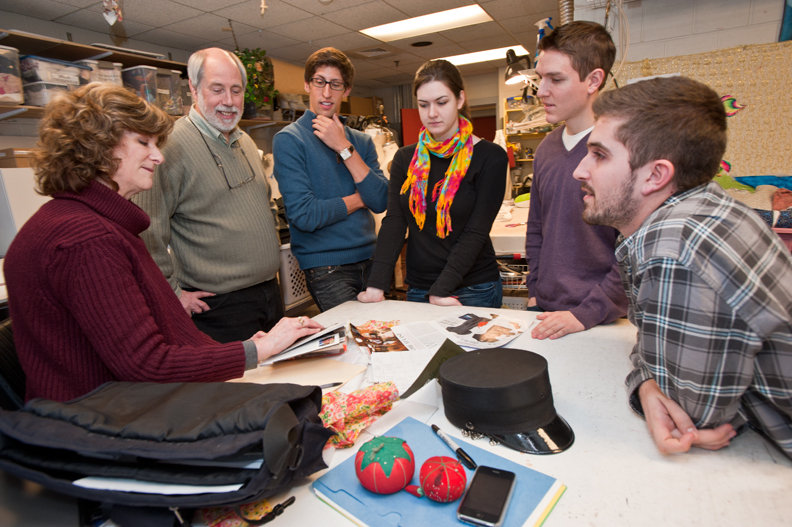 At a January 14 meeting in the Robsham costume shop, costume designer Jackie Dalley (left), discusses set ideas for The Missing Piece with (clockwise) Cummings, Madincea, and cast members Maggie Kearnan ’14, Owen Grover ’12, and Steven Kreager ’12. This feature was posted on Wednesday, January 19, 2011 and is filed under Featured Photo.